The annual art school degree shows throw up some of the most experimental and bewildering art around. True to form, this year’s Slade MA/MFA presents a rambling yet revealing survey of a new generation of artists. Unshackled from curatorial argument, 70 young international artists have installed the end products of their two-year courses throughout the Slade’s labyrinthine studios. A dizzying array of art conceived outside the constraints of the art market – the closest thing you’ll find (for better or worse) to “art for art’s sake”. Japanese artist Haruka Ono has built a quixotic miniature landscape out of frozen food (British frozen food in a tabletop freezer, 2010). Housed within a domestic, glass-topped freezer, this painstakingly crafted foodscape includes forests of green beans, cauliflower trees, and a pizza plateau, while potato waffles loosely suggest fragments of rock or a Hansel and Gretel-style hut. Ice-coated supermarket fare evokes the landscape from which it sprung, in miniature and ephemeral form – a brilliantly and comically apposite identification of fruit with root. 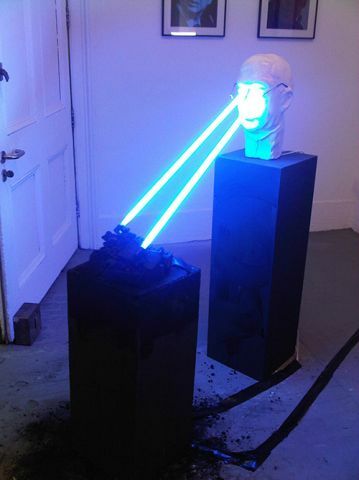 One of the most striking installations in the show is a pair of sculptures of heads with glaring neon tubes extending out of their eye sockets and resting on separate platforms by Tintin Cooper. Within this collision of figurative and abstract modes, of traditional sculpture and a material strongly redolent of Minimalism, is an echo of the ancient theory that the gazing eye emits spiritus, an invisible ray of atoms which streams out of the eyes to meet objects in the field of vision. As visitors circled busily around them, the works struck me as apt metaphors for seeing (or not seeing), the glaring light making them paradoxically difficult to look at. Painting, as often, is the weakest element in the exhibition – frustratingly underrepresented and, where it does appear, out of synch with the nuanced, metaphorical quality of much of the sculpture and installation. Over all, painting too often seem to be playing a walk-on part, in the service of bigger, multidisciplinary installations. Among the painters whose work does stand out is Nicholas Jones, whose multilayered, vaguely biomorphic compositions teeter on the brink of figuration and call to mind phosphenes – the half-recognisable, chimerical forms we see through closed or rubbed eyes. Another exciting talent is Gracjana Rejmer. 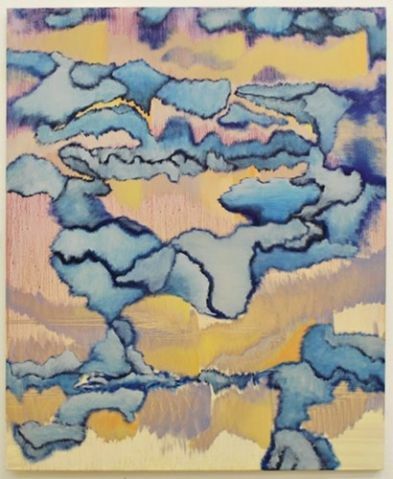 Her abstract landscapes pulsate with swimming expanses of colour – rising up in tiers or colliding dramatically – to create a kind of painterly synaesthesia. Nadine Mahony’s miniature portraits in oil, which resemble charred or acid-burnt surfaces, are also compelling and charged with emotion. At the conceptual end of the scale, Rudolf Reiber’s installation A Whiter Shade of Pale, which at first glance resembles an empty room, consists of four walls painted the exact shade of white used in four major museums (MoMA, Tate Modern etc.). This provides a wry insight into the standardised systems and practices which pervade such institutions. My personal highlight was a series of small drawings by ‘Joana BC‘, poised somewhere between the off-the-wall imaginings of cartoonist Steve Bell and a plaintive anthropomorphism. The drawings are populated by people, rodents and other creatures alike, often in twee or chintzy interior settings. Nearby Joana has built a kind of Wendy House resembling one of these interiors, in which 2D elements interact with curtains and props in a bizarre ‘half-realisation’ of the world of her drawings. Like any group show, the Slade students’ works range from the genuinely thrilling to the abstruse. Theory sometimes seems to eclipse, or entirely stamp out, practice. But while madcap and mystifying in equal measure, the Slade display is overall satisfyingly free of pomposity, and marked by several talents to watch.